I'm probably biased, but for my money you just can't beat summer in the Far North. I think what we have here is about as good as it gets. And I'm not alone. New Zealanders and foreign tourists alike flock to our District during the holiday period. They come here to share our wonderful harbours, our kai moana, our forests and, perhaps for a number of them, a nostalgic idea of how life used to be. Along with our traditional drawcards of sun, surf and sand, this summer we're also offering visitors something new. There's the fantastic Waitangi Mountain Bike Park that opened in October and also the Twin Coast Trail - Pou Herenga Tai. It's taken a lot of negotiation and work, but we're almost there. The official opening will be early in the New Year, but you can ride most of the trail already. These attractions are diversifying our tourism industry by providing new business opportunities in established tourism hubs like Paihia, but also in new areas along the cycle trail. I believe both attractions will be hugely beneficial for the District. With so many visitors, our communities come under greater scrutiny. You may have read in this paper about an illegal rubbish dump Council cleaned up in Ngaiotonga Scenic Reserve near Russell. This story received much publicity after an appalled tourist publicised what he had found in this beautiful reserve. Ratepayers spent around $14,000 on the Ngaiotonga clean-up, but that's a fraction of what was paid in 2015 cleaning up illegal dumps. Together we spent close to $65,000 to remove fridges, tires, car bodies, mattresses and household rubbish pushed off roadsides and into streams across the Far North. People ask why we don't prosecute these vandals. We do when we can, but legal action should be a last resort not our first option. The answer lies with us, the people of the Far North. Those who show so little regard for our precious environment need to get a clear message that it's not acceptable to desecrate where we swim, where we walk or the water we drink. Visitors come here to see and experience the culture and beauty of the Far North. We have so much to offer, so let's make sure they want to come back. This is my final column for 2016. I wish you all a wonderful Christmas with whanau and friends wherever you are. Look after your loved ones and I wish you a great Far North summer. What is the population of New Zealand? It is a question most New Zealanders can probably answer with varying degrees of accuracy. But how many Kiwis would have a clue about the country's canine population. You may be surprised to know that there were 552,236 registered dogs in New Zealand in May 2016. This is slightly less than the combined populations of Wellington and Christchurch and doesn't include unregistered dogs which may number in the six-figure range as well. These figures shouldn't come as a surprise. Many of us own dogs, or have whanau and friends with dogs. Even if we don't have a dog, we encounter them on the street, in parks and at the beach. Put simply, dogs are everywhere. One of the biggest challenges local authorities face is regulating dogs in a way that takes into account the interests of a wide range of people and animals. Dog-owners want to be able to exercise their dogs in public, but local authorities also have a duty to ensure that dogs don't threaten or pose a nuisance to people, livestock and wildlife. Getting the balance right isn't easy, but that is what we are seeking to do in a dog control bylaw we are currently seeking public feedback on. The law requires local authorities to review their dog control bylaws every 10 years. On top of this, the Government has told local authorities they need to do more to reduce dog attacks. The Far North District Council has until June 2017 to adopt a new bylaw, so is asking people to share their views on how, where and when dogs should be controlled, as well as how the Council can encourage responsible dog ownership. We are keen to ensure the bylaw addresses issues from multiple perspectives, so asked a range of groups, including the SPCA and Department of Conservation, to help us draft our statement of proposal. The proposed bylaw covers many issues, but the most contentious is likely to be where and when people can exercise their dogs in public and which public places dogs should be banned from altogether. We have a duty to protect people and endangered wildlife at our busy beaches from dogs. However, we are also under pressure to relax restrictions on dogs in areas where they don't pose a threat to people or wildlife. That is why we are proposing to remove restrictions on dogs on beaches in the winter when there are few people around and shore birds aren't nesting. We are also proposing to introduce a new, cheaper registration category for dog-owners who register, microchip and look after their dogs well. We are trying to balance the interests of people, dogs and other animals, so it is important we hear the views of as many people as possible. Please take the time to find out what we are proposing and have your say before submissions close on 16 December. Help us to strike the right balance. Once again, we have been reminded of how vulnerable our nation is to the destructive forces of nature. The 7.5 magnitude earthquake that struck Hanmer Springs on Monday, killing two people and damaging buildings and roads from Wellington to Christchurch, was New Zealand's sixth largest quake. It was also stronger than the 7.1 and 6.3 magnitude quakes that jolted Canterbury in 2010 and 2011. As the Civil Defence Minister at the time of those quakes, which took the lives of 185 people, I saw first-hand the destruction they caused. I sympathise with those people who have family or friends in areas shaken by the latest quake. We are fortunate in the Far North to live in one of the most seismically stable parts of New Zealand. However, our long coastline makes us more vulnerable to tsunami than many other districts. That is why the Far North District Council and Northland Civil Defence Emergency Management Group installed 58 tsunami sirens in coastal communities from Te Hapua to Russell a few years ago. We activated these sirens on Monday after the Ministry of Civil Defence and Emergency Management issued a tsunami warning for the east coasts of the North and South Islands. Fortunately, most of the wave activity caused by the earthquake and aftershocks was minor and in the Wellington and Kaikoura areas. We were therefore able to downgrade the tsunami warning to a beach and marine threat to warn people of unusually strong currents and unpredictable water flows near the shore. I would like to thank those people who heeded the sirens, evacuated their homes and moved to higher ground. I also want to commend those who stayed away from the sea, alerted friends, family and neighbours and listened to the radio and TV for updates. All of these simple actions will help to keep you safe if a tsunami hits Northland. I would strongly encourage those of you who live in low-lying coastal areas to develop a household emergency plan if you haven't already done so. Go to the Get Thru website for tips and guidelines and find out if your community has a disaster response plan. It is also important that you understand the natural warning signs of a tsunami, because there may not be time for authorities to issue a warning if one is generated close to New Zealand. The Council has run two marketing campaigns this year to educate people about these warning signs, which include loud and unusual noises from the sea and a sudden rise or fall in sea level. You should also move to higher ground immediately if you are at the coast and feel a strong earthquake that makes it hard to stand up or a weak, rolling earthquake that lasts a minute or more. If you don't think you need to know or do any of these things, ask yourself this question; if a tsunami happened now, would you be ready? I want to update you on policing in Kaitaia. As you know, Kaitaia made national headlines earlier this year for all the wrongs reasons. A spate of serious crimes, including several murders, saw our town dubbed the "Murder capital of New Zealand" by media. Once again the Far North, and Kaitaia in particular, was painted as a wild-west frontier of gang and drug-related crime. Kaitaia resident Naomi Austen-Reid dared tell another story by promoting the hashtag #ILoveKaitaia with her Facebook friends. Hundreds supported her view. Of course, crime is a problem in Kaitaia - just as it is in many small New Zealand towns. There is no one answer to the problem, but one of the first questions we must ask is: Do our police have the staff and the resources to do the job we ask of them? Like others, my conclusion to that is: No, they don't. So I wrote directly to the Minister of Police early in October and asked her to boost police staff in Kaitaia. I told her that while there are 32 officers on patrol, there is no 24-hour Kaitaia-based policing. This is a fundamental problem and I strongly urged her to allocate additional resources to allow 24-hour policing. We do not want a redistribution of resources, but rather the allocation of new resources. Kaitaia wants successful and popular preventative policing strategies bolstered by extra resources – not a reshuffling of existing staff to achieve a 24-hour presence. I received a reply last week and I want to share what Hon Judith Collins said. Firstly, she acknowledged the extra pressure frontline police have been under and said that from 10 October a Northland detective sergeant and another four detectives had been deployed to the town. These staff will be retained for the next 12 months, initially providing cover for investigators resting after the recent series of high profile crimes. She went on to say that a Field Crime Inspector will be employed and that this inspector will help supervise serious crime investigations in Kaitaia. Another six positions are also due to be advertised this month and will be attached to Kaitaia's Whangaia Nga Pa Harakeke project – Thriving Children, Strong families, Resilient Communities. Will this be enough? I will discuss that with Superintendent Russell Le Prou, District Commander of Northland Police when we next meet. As a Council, one of our priorities is to boost sustainable economic development across the Far North. That requires a community that feels safe and secure. A community that knows its loved ones and its property are protected round the clock. That is why I asked for extra police resources. I hope the Minister's response makes a difference. Last week, I had the privilege of being sworn in as Mayor of the Far North District for a second time. It was an honour to be given the opportunity to serve the people of the Far North for another three years and I was moved by the powhiri that Council staff laid on for me and the new councillors. However, I was also aware that the historical importance of the occasion was ephemeral. Allow me to explain. When I was a Member of Parliament, I used to say to new MPs, no one knew you when you got here and no one will remember you when you've gone. It is what you achieve for New Zealanders while you are here that matters. It is no different when you are a Mayor or district councillor. You are elected to serve the community and while that is a big responsibility, history is largely indifferent to your contribution. To prove my theory, I asked my colleagues who could name the Mayor and councillors of the first Far North District Council. None could. It demonstrates my point that we are mere servants elected by the people to do a job. We distinguish ourselves not by who we are, but by what we achieve for the District, as well as how we execute these duties. We serve our communities best when we listen to them and when we make decisions based on good information. We are also more effective public servants if we set aside personal differences and work as a team. It was gratifying to see the people of the Far North re-elect all but one member of the previous Council at the recent elections. However, that doesn't mean we can take the trust they have shown in us for granted, nor does it mean our work is done or there is no room for improvement. We face big challenges as a district and the Council still has a long way to go before it is a high-performance organisation that is customer-focused and guided by the community in its decision-making. We also need to do a better job of informing communities about the services we provide and the value we add to people's daily lives. Councils up and down the country provide vital services every day that people literally cannot live without. We need to educate communities about the challenges and costs associated with providing these services, so they understand what causes their rates to rise and why they need to be involved in our decision-making. We are here to serve the community, but like all servants we rely on our masters to direct us. I encourage you to take more interest in your council over the next three years. We will achieve more for the district if we work together than if we work apart. 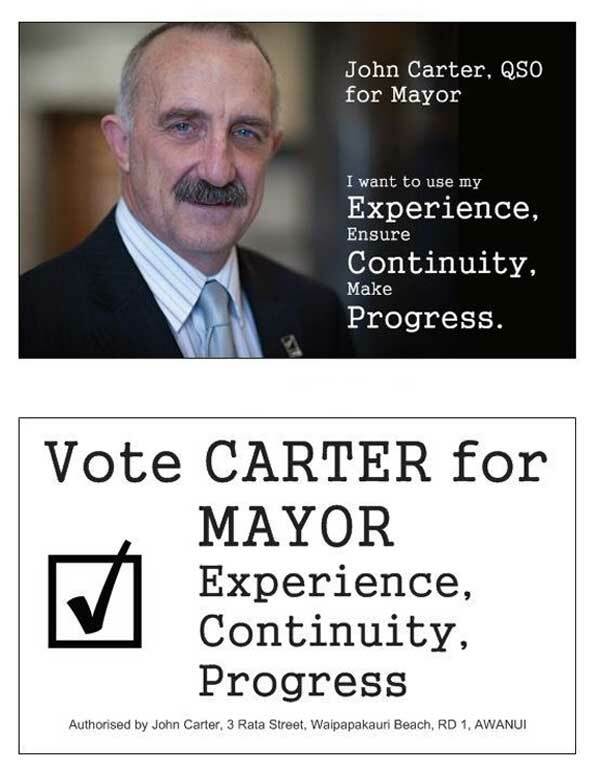 John Carter won a second term as Far North Mayor on Saturday, easily beating sole challenger Peter Gill. Provisional results gave Mr Carter 10,889 votes to Mr Gill's 4485. That was more votes than he received in 2013, in a field of seven candidates, and a greater share of the total vote, although his 2013 majority was trimmed from 6736 to 6404. Mr Carter said the result was very pleasing, but clearly there was some anxiety in the community. "I've heard that message loud and clear," he said on Saturday afternoon. "We now have to look at these results, analyse them and understand what they mean. The council's service levels still need a hell of a lot of improvement, and that's what we will be looking at. My message to the council next week will be that small things matter. "I don't think the council communicates well enough with the community, and we will be looking at that too," he added. "The people have spoken. Well, around 40 per cent of them anyway," he said. "The majority say they are happy with the council leadership as it stands. I accept that. Well its election time again and as you may have already noticed, I am putting both hands up for the job for another term. This first 3 years has been about putting right some of the things that were alarming the community, and changing the culture of the organisation to put our people first. It's also been about convincing the community that this Council has been about being "community led", and that it is the community who really should, and must, decide for itself what it wants, and the Council should back them. I have really enjoyed meeting the many and varied communities in our Far North District, listening to their aspirations, and helping in any way I can to help them achieve great things. Regionally, we have also forged good strong links with our Northland neighbours and we have worked effectively as team pitching our ideas for a stronger Northland. There is still much to do to consolidate the work I have started and I would be so grateful for your vote of confidence and another term as your Mayor. People in the Far North will get an opportunity to elect a new Mayor and Council in three months, so it is timely to look back on what elected members and staff have collectively achieved for residents and ratepayers over the last three years. We have bought land for a new Kerikeri Wastewater Treatment Plant and expect to begin work on this project - one of the largest the Council has undertaken - in October. We are also addressing overflow issues at Kaitaia's ageing wastewater system and aim to have developed an engineering solution to this historic problem before the end of the year. We secured a Ministry of Health subsidy to upgrade our untreated water supply at Omanaia and are helping Te Kao and Opononi-Omapere communities investigate affordable ways of improving their water supplies. In 2014, we suffered one of the worst storms to hit the Far North in years. Yet we completed emergency repairs to roads ahead of schedule and we are now working on a proposal to strengthen roads heavily used by logging trucks. We also established, with other Northland councils, a Northland Transportation Alliance which is expected to save $18 million over 10 years. It is our intention to reinvest this money back into Northland's roading network, so this alliance represents a big step forward in terms of how we deliver local government services. Northland councils also persuaded the New Zealand Transport Agency to designate Mangakahia Road as a state highway and inland freight route. This will free up ratepayer money previously used to maintain this road and also result in a higher level of maintenance. Collaborating with other Northland councils to improve local government services has been a priority for this Council. There is now an unprecedented level of cooperation between the councils and a commitment to a strategic plan which aims to lift Northland's social, economic and environmental performance. We also facilitated the development of a District vision to guide decision-making and priority setting across the Far North and contributed to a Northland Economic Action Plan which promises to be a game-changer for the region's economy. Improving relations with Maori and helping them to achieve their goals has also been a big focus for us. We have invested in extra staff to help hapu develop strategic plans and signed partnership agreements with Te Runanga o Te Rarawa and Te Runanga o Ngati Hine. We facilitated the formation of a statutory board to manage Te Oneroa a Tōhē/Ninety Mile Beach with iwi and we are helping owners of Maori freehold land to unlock the economic potential of their land. Finally, we have secured landowner agreements and funding for the Twin Coast Cycle Trail - Pou Herenga Tai. We aim to complete the remaining sections of this fantastic recreational amenity, which will attract thousands of visitors to the Far North, before summer. We have done all of these things by working cooperatively with our communities, Maori and other agencies. That is how we will address opportunities and challenges facing the District. That is how we will move forward together. It's that time of the year when we celebrate those people who do extraordinary, unpaid work that makes our District a better place. Nominations for the 2016 Citizen Awards are now open, so I encourage people to think about nominating someone for one of these awards which are now in their 16th year. Past recipients of the awards have included volunteer fire officers with outstanding service records, sports club coaches of legend and people who have given their time, labour and love to all sorts of community projects. The bar is high, but only because the quality of volunteers in the District is. Most of us should therefore be able to think of someone who is a contender for an award. I must confess that we have wondered whether there is a need to keep holding the Citizen Awards. The Kiwibank New Zealander of the Year Awards are now the gold standard for individual achievement, so it can be difficult to build interest in the awards. However, each year we are reminded of why the awards are worthwhile. First, they are one of the few Council-hosted events where all kinds of people from across the District come together to share stories. These gatherings are important to the wellbeing of our district. They help to break down barriers, dispel myths and give us a deeper appreciation of the strength we have in our small, diverse population. The awards also help to reinforce charitable behaviour in a world where people have become more self-absorbed. We can all imagine how bleak our lives would be if people only worked for money or only acted out of self-interest. Fortunately, that is not the District we live in. I am constantly amazed by the voluntary work that is undertaken across the District every day by thousands of people who are willing to do something for their community or for someone else. It may be the dad who coaches his son's soccer team in his spare time, the pensioner who answers the phones at the Citizen Advice Bureau or the committee member who helps to organise the local A & P Show. The list is almost endless. The miracle is not that people do all this work unpaid, but that many don't see it as a sacrifice or imposition. Voluntary work gets retired people out of their homes and makes them feel valued and useful, while many parents see getting involved in sports teams and school committees as an opportunity to support their children and make new friends. This doesn't mean we shouldn't celebrate these contributions or thank these amazing people for helping to make our District a great place. Please think about someone you know who may deserve a Citizen Award and fill in a nomination form before nominations close on 13 July. Go to the FNDC website for details and please help us to find our local heroes. Our nation has farewelled two great New Zealanders in the last four days. On Sunday, one of our greatest Maori leaders, Sir Graham Latimer, was laid to rest at Pamapuria. On Tuesday, Charlie Petera, the last surviving member of the 28th Maori Battalion's A Company was interred at Ngataki. I would like to thank The Northland Age for respecting the memory of these men with prominent coverage in Tuesday's edition. Both Sir Graham and Charlie made extraordinary contributions to our nation. While their passing is a sad occasion, we should celebrate what they achieved and be proud to claim them as Northlanders. Sir Graham was a personal friend who I held in high regard. He grew up poor and left school at 14 to work on the family farm. Yet, he achieved great things for Maori and New Zealanders. He learned the virtues of hard work and he understood that the best results are achieved through diligence and perseverance. He also treated friend and foe alike with unfailing courtesy. While he was a strong National Party man - being its candidate for the Northern Maori seat twice and serving as party vice-president - he developed strong friendships across the political divide. One of his closest friends was Matiu (Mat) Rata, Minister of Maori Affairs in the third Labour Government. Together they helped enact legislation that created the Waitangi Tribunal and changed the Treaty's status from a historical relic to the founding document of our nation. When the fourth Labour Government established state-owned enterprises, Sir Graham believed the newly-created commercial entities might not honour the Crown's commitments to Maori under the Treaty. Sir Graham urged the Maori Council, which he chaired, to go to court in a case that went all the way to Privy Council in London. The Maori Council lacked the funds to pay for a long-running legal battle with the Government, so Sir Graham raised this money by mortgaging his farm. He was rewarded for this personal sacrifice when the Privy Council ruled in the Maori Council's favour. Parliament then changed the State-Owned Enterprises Act to prevent the Crown sidestepping its Treaty obligations. Many of the Treaty settlements of the last two decades have only been possible, because of Sir Graham's dogged determination. We also owe a big debt of gratitude to Charlie Petera who survived the 1944 Monte Cassino battle, one of the bloodiest battles of World War II. Charlie continued to make a big contribution to our nation when he returned to New Zealand after the war. He kept Ngati Kuri's reo and culture alive and helped establish a Whangarei Leadership Academy that revived successful learning and achievement models for Maori men. We should feel honoured to count Sir Graham and Charlie Petera as our own. They were true New Zealanders. I know many Kerikeri residents and business-owners were pleased by the Council's recent announcement that it had not only bought a site for the town's much-anticipated new wastewater treatment plant, but it expected to build and commission the new plant by October 2017. Most people agree that a new plant is crucial to Kerikeri. For a start, it replaces an ageing plant, which was intended as a temporary measure 25 years ago, with a state-of-the-art plant three kilometres out of town. The decision to locate the new plant in a disused quarry surrounded by 15 hectares of rural land is great news for people who live in the residential area that has grown up around the existing treatment plant. The new plant also means Kerikeri's growth is no longer held back by a small plant that is operating at its limits and unable to treat the sewage from the town's growing number of households and businesses. Kerikeri's population grew by 11% to 6,507 in the 2013 Census, prompting this newspaper to dub it the Far North's 'Auckland', so the new sewerage system is long overdue. The new plant and expanded sewerage network will cater for up to 400 additional properties and this is just stage one. Being a modular design, the plant can be expanded in future years. This will provide Kerikeri with a platform for growth in much the same way that an expanded sewerage system gave Tauranga a platform for growth in the early 1980s. Of course, Kerikeri isn't the only town in the Far North that needs sewerage improvements. We are addressing an urgent need to upgrade Paihia's wastewater treatment plant, which is failing to meet resource consent standards. We are also seeking expressions of interest from engineers about how to fix Kaitaia's ageing wastewater system which wasn't designed to cope with current volumes of sewage and stormwater. We highlighted this problem, along with other historic gaps in our services and infrastructure, when we consulted on our Long Term Plan 2015-25. We don't have solutions for all of these problems yet, but we have made significant progress and notched up some big wins over the last three years. The four Northland councils and the New Zealand Transport Agency recently formed a Northland Transportation Alliance, which is expected to save $18 million in roading costs over 10 years. We have also secured a Government subsidy to upgrade an untreated water supply at Omanaia and we are working with communities on improvements to water supplies at Te Kao and Opononi. We still have a long way to go with these and other infrastructure projects, but we are on a path to progress, thanks to a lot of hard work by Council staff, elected members, contractors and members of the community. Watch this space for more information about the things we are planning in 2016/17 to make the District a better place. The growth of community-led conservation groups in New Zealand in the last 20 years is one of the great Kiwi success stories. Thousands of farmers now factor sustainability and biodiversity protection into their business plans, while scores of groups have sprung up to arrest the decline of threatened species including the Kiwi. Here in the Far North, we are blessed with some really outstanding conservation groups. I was really pleased to see two of these groups get well-deserved recognition last week. Bay Bush Action won the Supreme Award at the 2016 Trustpower Far North Awards in Kerikeri on Thursday, while Te Runanga o Te Rarawa won the Excellence in Environmental Management and Awareness Award at this year's Te Hiringa Tai Tokerau Maori Business Awards in Whangarei on Friday. These are both well-deserved wins and I am stoked that these groups have received this recognition. There was virtually no dawn chorus in the Opua State Forest before Bay Bush Action starting controlling pests there in 2011. Since then, the trust's volunteers have eradicated more than 7,300 rats, mice, possums, stoats, weasels and cats. The result is that bird song is heard again in the 450 hectare pest control area and trees that were once close to death are healthy again. The situation was just as dire before a pest eradication programme got underway at Warawara Forest in 2014. The 13,300 hectare forest between the Hokianga and Whangape Harbours is the only virgin kauri forest outside Waipoua. It has the second highest biodiversity ranking of any Northland forest and is home to numerous endangered species, including rare native bats and Northland's only population of the titipounamu (rifleman). But the forest was dying at an alarming rate. Rats and stoats were killing kiwi and taking chicks from their nests, while possums were eating their way through the forest's kohekohe trees. Today, the Warawara has a chance of survival, thanks to a conservation initiative involving marae, community groups, landowners, Te Runanga o Te Rarawa, the Department of Conservation and the Northland Regional Council. It is exciting to see collaboration on this scale, especially as this is the result of a co-governance arrangement between the Crown and Te Rarawa. Bay Bush Action has also been successful at involving the wider community in its conservation programme. Inmates at Ngawha Prison built nesting boxes for Kiwi using materials donated by local businesses, while the Waitangi Cubs and pupils at Paihia and Opua Schools painted nesting boxes for blue penguin. The wider community also gets involved in a fortnightly beach clean-up that Bay Bush Action organises at Paihia beaches. I want to thank and congratulate everyone involved in these projects. You have helped to create a cloak of protection for these precious forests and the wildlife that live in them and demonstrated what we can achieve when we work together. Thank you! Most Northlanders would have trouble finding Matawaia on a map, let alone have any reason to go there. The tiny settlement is a dot in the vast hill country between State Highway 1 and Mangakahia Road and is more likely to be glimpsed from an aeroplane than seen close up. But for Ngati Hine, Matawaia and nearby Motatau are strongholds in a rohe that covers a large area of Northland. And while many of these communities might feel hidden and forgotten, these are not words you would use to describe Ngati Hine. Ngati Hine has become a major player in our District and a force to be reckoned with - even in the kitchen. The husband and wife duo who won Maori Television's recent cooking series Marae Kai Masters were Anthony and Kathy Dunn from Matawaia Marae. So, it was a privilege and an honour to make the long journey out to Matawaia Marae earlier this month to sign a Memorandum of Understanding with Te Runanga o Ngati Hine. This historic document outlines our willingness to cooperate with each other at a strategic level and commits us to meeting at least four times a year and to developing a work programme that supports shared strategic objectives. It also makes provisions for Ngati Hine to contribute to Council policy-making and to advise Council on matters affecting its rohe. The agreement marks a new era of cooperation with Ngati Hine and is another milestone for the Council's relations with Maori. We signed a Memorandum of Understanding with Te Runanga o Te Rarawa last year and plan to enter into similar agreements with other willing iwi/hapu in the next three years as part of a wider programme of work aimed at improving the way we engage with communities. Of course, agreements are just words on paper if there isn't a genuine commitment to making the relationship work. There also needs to be trust, respect and a willingness to listen and understand. I want to reassure Ngati Hine and the wider community that there is that commitment. We have been demonstrating this in communities across the Far North for the last three years and are already seeing the benefits of this approach. This is progress we can celebrate; not just as a district, but as a nation. Here's to understanding and cooperation. Mauri ora! When we go for a run, do our shopping, walk the dog, or take our family to the park, we should feel safe. Our main streets should be places where we feel comfortable going about our business day or night without fearing for our personal safety. Unfortunately, that is not the case in some of our towns. Many of us avoid these areas, particularly at night because we fear being hassled, assaulted or robbed. But when the public stays away, there are fewer eyes and ears around to witness and report suspicious behaviour, so crime thrives. That's what was happening in Kaitaia's central business district for many years. Businesses were regularly broken into or vandalised with graffiti and business owners were spending a lot of their time clearing up the mess or filling in insurance forms. Something had to be done and something was done. The community rallied together and came up with the idea of creating a network of closed-circuit cameras that provided comprehensive coverage of the central business area. The idea for the cameras came from Te Aupouri Maori Trust Board and the Far North Safer Community Council, supported by Kaitaia Police and the Kaitaia Business Association. What makes the Kaitaia initiative special is that the 120 cameras are monitored 24 hours a day, seven days a week by a local company, Total Security Management, at Kaitaia Police Station. If they see anything suspicious, they alert the police immediately and a patrol is dispatched to the location. The results so far have been spectacular, with burglaries in central Kaitaia down by 60% in the six months since the initiative got underway. The support from Kaitaia Police has also been fantastic, so much so that the station's Te Hiku o Te Ika Neighbourhood Police Team won a national Problem-Orientated Police Award in Wellington recently. I would like to congratulate and thank everyone involved in making this project a success. Public safety and crime prevention are community issues and demand a community response. In this case, the community stepped up and came up with a solution that made good use of cost-effective technology and police resources. The result is that people feel safer in Kaitaia's main street at night, while business owners know that police will deal with illegal or potentially illegal activity promptly. I am proud of the way Kaitaia came up with its own solution to a serious problem and didn't wait for Wellington to impose a solution on it. I am also pleased to have played an advocacy role in this project which created jobs for nine long-term unemployed people. Its success shows the strength we collectively possess as a community and what we can achieve if we care enough, have a good plan and all work together. Kia kaha, Kaitaia! I have long-believed that only good can come from sister city relationships. They foster friendship and understanding between people of different countries and cultures and open up trade, investment and education opportunities. The wider public perception may be that they are a waste of money, but the experience of those directly involved in these relationships is otherwise. Sister Cities New Zealand estimates that sister city relationships are worth $50 million to the nation's economy in education exchanges and tourism business alone. A New Zealand Institute of Economic Research Study in 2003 calculated that an education programme that allowed students from Guangzhou in China to study in Auckland added $24 million to Auckland's economy each year. China Southern Airlines even cited Guangzhou's sister city relationship with Auckland when it introduced direct flights between the two cities in 2010. The new air service has increased in-bound tourism in New Zealand and put China's third largest city in reach of our exporters. Auckland isn't the only city to benefit from sister city relationships. A Bay of Plenty agricultural firm secured export contracts worth more than $1 million by leveraging Tauranga's sister city relationship with Yantai in China. A week-long cultural visit by a 100-member orchestra from Kurashiki in Japan added an estimated $175,000 to Christchurch's economy. These are just a few examples of the tangible benefits sister city relationships create if they are well-managed. Auckland Council has also used Auckland's sister city relationship with Brisbane to share information and technology in areas, including transport network planning, public private partnerships in reading and events management. Here in the Far North, Kerikeri High School has had a long-running student exchange programme with Taikyu High School in our sister city Yuasa in Japan. I am keen to see other schools in the district explore opportunities for similar programmes with our other sister cities in Liaoning (China) and Duncan (Canada). Students who take part in these exchanges gain valuable life experiences. These were highlighted at this year's Sister Cities Conference which I and councillor Sally Macauley attended last month. The conference was an opportunity to network with more than 120 mayors, councillors and business representatives involved in sister cities. I came away feeling optimistic about the future of sister cities and even more certain of their need. The world is becoming a more dangerous and violent place, largely as a result of ignorance and intolerance. We need more friendly contact and understanding between ordinary people of diverse cultures if global peace, democracy and economic prosperity are to be anything more than a dream. Sister city relationships have an important role to play in helping to build these bridges across borders. Most people know that local authorities hold triennial elections later this year, but many people may not be aware that New Zealanders also elect boards of trustees for schools in 2016. The election of boards at 2,500 schools every three years is one of the most important democratic exercises in New Zealand, but it doesn't always get the attention it deserves. I commend the New Zealand School Trustees Association and Ministry of Education for campaigning this year to raise the profile of these elections. More than 15,000 people are needed to form school boards across New Zealand, so this is a major call-up, especially when you consider that less than 1,000 councillors and Mayors are elected to New Zealand's territorial authorities. I also support the Association's call for skilled and experienced people to stand as candidates. School boards play a vital role in our schools and, by extension, New Zealand's future. They have overall responsibility for the governance of schools, setting their educational goals and strategic direction. They are also accountable for ensuring that students achieve academically and that schools comply with the law and are good employers. In short, school trustees are critical to the success of our education system our economy and our communities. One of the challenges we face in the sparsely-populated Far North is finding enough people with the right skills and experience to stand as trustees in board elections at the 72 schools in the district. The membership of a board needs to reflect the diversity of the school's community. However, trustees also need to have the skills and experience needed to govern effectively and raise student achievement. The Ministry of Education has appointed commissioners or limited statutory managers to run a number of schools in the District over the years because it has been concerned about poor governance or the education and welfare of students. I encourage people with the skills and attributes needed to make a positive difference to our children's learning to stand for election this year, so we get the best possible boards for our schools. Candidates don't need to be parents or have children at the school they are seeking election to. Also, professional development and support are offered to trustees to help them to deal with challenges and govern effectively. There is therefore nothing to stop any adult from putting themselves forward for election, provided they meet criteria under the Education Act 1989. More than 110,000 New Zealanders have taken on the trusteeship role since 1989, so this is not a role reserved for a small elite. It is more a question of asking yourself: Am I strategic? Do I ask questions? Do I work well in a team? Can I put students at the centre of every decision I make as a trustee? If you answered yes to each of those questions, please think about becoming a school trustee. It is a great way to support your school, your community and your country. On Monday, I had the privilege of attending and speaking at Anzac Day services in Kerikeri and Kaitaia. This year's Anzac Day was special because it was the 100th anniversary of the first Anzac Day on 25 April 1916. The Gallipoli landings had taken place exactly a year earlier and the then coalition government wanted a day to remember those who had fought so bravely in the ultimately unsuccessful campaign. Ever since, Kiwis have gathered on 25 April to remember those who fought and those who never came back, not only at Gallipoli but in conflicts before and since. Some of these wars were controversial and unpopular in some sectors. Nevertheless, our fathers, grandfathers, mothers and grandmothers put their own interests aside and put their country first. Those from the north who served their country were ordinary folk who tilled the land, logged our forests, owned shops or taught at our schools. They saw the horrors of war and saw friends and colleagues killed or seriously wounded. They did not seek to be heroes. They just did their duty. Those who made it home returned to their families and resumed their lives. But they never forgot their war experiences, even if they seldom spoke of them. As their lives ended, memories of their contribution faded. But we should not forget who they were or what they did. I would like to commend the Kaitaia College students who produced the World War One displays that were on show at Te Ahu for the rededication of the Angel Memorial last month. These poignantly told the stories of local soldiers who served in the Great War. Over in Kaeo, the lead-up to Anzac Day was an opportunity to remember Major William "Ben" Porter. Major Porter was a Kaeo taxi driver who volunteered at the start of World War Two and became the commander of A Company of the 28th Maori Battalion. Major Porter led an attack that captured and destroyed 16 German machine gun positions in North Africa in 1942. As a result, he received a Bar to his Military Cross from General Bernard Montgomery. But Ben Porter never let heroism go to his head. Apparently he turned down the job of Commander of the entire Maori Battalion because he wanted to fight alongside his men in A Company. After he returned home, Ben seldom spoke of his war experiences, except when sharing stories at Maori Battalion reunions. Ben died in 1998 and his contribution may have been forgotten by the Far North community. However, Emmy Award-winning art director and Whangaroa resident Alistair Kay saw his grave and was intrigued enough to organise an exhibition which the Bay of Islands-Whangaroa Community Board funded. It is important that we don't forget the service and sacrifices our forebears made on our behalf. I encourage other communities to organise similar exhibitions next year, so we remember those who made the ultimate sacrifice. Anyone who reads this column on a regular basis will know that the Far North District Council is committed to becoming a more community-focused organisation. This means talking and listening to residents and ratepayers so that our decision-making is informed by an understanding of their concerns and aspirations. It also means making it easier for people to engage with us. A lot of people have opinions about the Council and the services it provides, but aren't comfortable with the formality of public submission processes. The hearings we have held in the past for our Annual and Long Term Plans are a good example. Each submitter is allocated seven minutes to speak about their submission while elected members listen. It is an efficient way to hear the views of a lot of people, but it is not a form of engagement some people are comfortable with. Submitters also have to travel to a central venue in each ward and hearings are held during the daytime when many people are at work. We decided not to hold formal hearings for our Annual Plan 2016/17, because we wanted to try out a less formal style of engagement. We held five community feedback meetings where we outlined our plan for 2016/17, then sought feedback on this from attendees. Staff recorded people's comments and councillors will consider this feedback before adopting the Annual Plan in June. Was it a worthwhile exercise? Yes. More than 100 people in total attended the meetings. Many appreciated our overview of Council's strategic direction and key projects and seemed happy with our progress towards goals in our Long Term Plan 2015-25. One attendee, who had been the Mayor of another local authority, commended us for our responsible debt position and for the quality and tone of our presentation which compared favourably to those he had sat through in Auckland. At other meetings, there were more robust discussions, with people voicing concerns about a range of issues. We were particularly impressed by the level of interaction and quality of feedback at a well-attended meeting at Opononi. We wanted to know if people supported our proposal to defer plans to draw water from Waimamaku River while we explored other ways of making our Opononi-Omapere water supply more drought-resilient. Hapu from Waimamaku made it clear that they didn't support any proposal to develop their awa as a water source. However, people also shared local knowledge about the existing water supply and suggested ways of making this more efficient. All in all, it was a really constructive discussion that took us closer to finding a solution that is affordable and supported by the community. It is not too late for you to have your say if you couldn't attend one of the meetings and you have a view on the level of funding Council makes available to community groups. The closing date for submissions is tomorrow at 4:30pm. However, we are able to accept late submissions until the end of next week, as long as people email to let us know these are coming. Last weekend, an important meeting took place at the Far North District Council's Chambers in Kaikohe. Twenty-one vibrant, skilful and talented young people from all over the Far North met for the first time to share their passion, experiences and desire to make the Far North a better place for young people. I regret being unable to attend the first meeting of the Far North Youth Council and would have jumped at the chance to be part of it if I had been 50 years younger. I am pleased that Deputy Mayor Tania McInnes was able to pass on my best wishes to our new youth councillors, as well as offer words of encouragement for their journey ahead. The high calibre of young people on the Youth Council is a reminder of the wonderful young people we have in the District. I met some of these young people during a recent visit to Far North Surf Lifesaving Club in Ahipara. The club has 30 junior lifeguards aged 14 and up who undertake patrols and respond to incidents. This is a great character-building experience for these young people who receive training in how to deal with rips and large waves, as well as how to successfully execute rescues. They also provide a valuable service to the community, supporting the police, marine rescue and the fire service and responding to callouts the length of 90-Mile Beach/Te Oneroa-a-Tōhē. Last weekend, the club's junior members helped provide rescue boat services to the Weet-Bix Kids TRYathalon in Waitangi, an event which attracted 1,200 competitors from across Northland. I commend these community-spirited young people who include one of our new Far North Youth Councillors Ethan Nemeroff. He and his colleagues are actively involved in saving lives whether it's out doing a search and rescue or informing people how to escape currents and be safe around the ocean. Other young people are serving their communities by taking part in a programme called Youth in Emergency Services (YES). YES offers young people hands-on training with emergency services organisations such as St John, Red Cross, the New Zealand Fire Service, the Northern Rural Fire Authority, Coastguard and Police. The programme started in Rotorua in 2013 and was introduced to the Far North by Civil Defence and Youth Development Minister Nikki Kaye the following year. We all know how important our first responders are. Most of us are also aware that these services rely on volunteers and some struggle to find new recruits to replace older members. YES is therefore not just a great youth development initiative, it also helps to ensure that these vital community services remain viable. YES has already been a huge success in Kaikohe and Kawakawa, so I am stoked to hear it is about to be rolled out in the Hokianga. Please encourage young people you know to take advantage of this opportunity if you live in the Hokianga. Please also thank a young person next time you see them doing something good for their community. Our young people need all the encouragement and guidance we can give them if they are to thrive and have bright futures. How much for the 'nice to haves'? The Far North District Council will hold the first of five community feedback sessions for its proposed Annual Plan 2016/17 tonight in Kerikeri. We are not holding formal hearings for this Annual Plan because we want to engage with people in a way they are more comfortable with. Also, we are only proposing three material changes to the Long Term Plan 2015-25 and two of these are about water supplies at Te Kao and Opononi. The third issue, which is likely to be of more interest to people and community groups outside these areas, is the question of how much money we make available for community projects in 2016/17. Council introduced and rated for a $200,000 Community Assistance Fund when it adopted its Annual Plan 2014/15, because we wanted to support cultural, sporting and recreational initiatives in a fairer, less ad hoc way. We used the fund to support a range of really worthwhile projects in 2014. These included a mountain bike park in the Waitangi Forest, boat storage and sailing clubrooms at Rawene, floodlights at Arnold Rae Park in Kaitaia and a new bowling green in Kawakawa. We were focused on renewing core infrastructure when we adopted our Long Term Plan 2015-25, so decided to suspend the fund in 2015/16. We are still progressing infrastructure renewals, so propose to reinstate the fund at $100,000 in 2017/18, instead of 2016/17 as planned. We will be asking people what they think about this proposal at the feedback sessions. We are also keen to know about projects that may be eligible for Community Assistance Funding. Some of the projects we funded in 2014 aren't complete and we aren't aware of others that meet the criteria, which require groups to meet at least 50% of project costs, so please get in touch if you know of any. We also want to know how much community boards should make available for community projects in 2016/17. The Community Grants Scheme has funded lots of great projects over the years from Christmas Parades to town beautification works. We reduced the fund from $357,176 to $267,881 last year to free up money for core infrastructure, but propose to restore it to $357,176 in 2016/17. We are keen to know if the community agrees with us. Please come along to the community feedback session at the Kerikeri Golf Club tonight at 5:30pm or attend our Kaitaia feedback session at Te Ahu on Monday 11 April at 5:30pm or our Kaikohe session at Council chambers on Monday 18 April. This is an opportunity to find out what we have achieved since we adopted our Long Term Plan 2015-25 and what we are planning in 2016/17. We will also be having more focused discussions with communities at Te Kao and Opononi-Omapere about affordable options for improving their water supplies. Staff will record the feedback people provide at these meetings and councillors will consider this before adopting the Annual Plan in June. Check out our website for more information and let us know what you think. I welcomed the news last week that the Ministry of Health and Ministry of Education are encouraging schools to ban sugary drinks in line with World Health Organisation recommendations. Sugary drinks are one of the main causes of poor oral health and contribute to childhood obesity and Type 2 diabetes. This may not come as a surprise to Northland Age readers, but the scale of the damage sugar causes might. In 2014/15, about 29,000 children in New Zealand aged 1-14 had one or more teeth removed due to decay. Tooth decay is now the most common childhood disease in New Zealand and one of the three leading causes of potentially avoidable hospitalisations among children. The statistics about New Zealand's diabetes epidemic are even more disturbing. Diabetes New Zealand reported last November that the number of people living with diabetes had doubled from 125,000 to 250,000 in the last 10 years. Forty New Zealanders were diagnosed with the disease each day and a further 1.1 million New Zealanders had 'pre-diabetes' and a high risk of developing the disease. We can't blame sugar alone for this problem. Other diet and lifestyle choices have helped to make us into a fatter, unhealthier nation. But anything we can do to reduce our sugar intake can only be good for our health and targeting sugary drinks in schools is a good place to start. A recent survey showed that 17% of Northland children drink fizzy drinks regularly and many of us know children who are sent to school each day with sugary drinks, such as fruit juice, in their lunch boxes. It is good to see that many schools in the Far North have already taken steps to create health-promoting environments. For example, Kaitaia-based Te Kura Kaupapa Maori o Pukemiro encourages students to drink 'wai Maori' as part of a Healthy Choices, Healthy Lifestyles Policy. I encourage other schools to safeguard the health of their pupils by only allowing them to drink water or low-fat milk. I commend Healthy Families Far North and Te Runanga o Te Rarawa for offering to help schools put in place water-only policies. I also encourage families and whanau to think about how they can support schools that decide to ban sugary drinks. Many children already have rotting teeth when they start primary school, so we need to tackle this problem on many fronts. Ultimately, the health of children is the responsibility of parents or caregivers. However, the Government has a supporting role to play. The Far North District Council and Northland District Health Board have already installed public drinking fountains in a number of towns in the District, so people have free alternatives to soft drinks. The Council is also working with two rural communities (Te Kao and Omanaia) to improve water supplies so they meet drinking water standards. We will be talking to Healthy Families Far North and the Northland District Health Board to see what else we can do to help our schools to become healthier places for our children. Today is a historic day for the Te Hiku area. At 10.30am, we will rededicate a memorial in Kaitaia to the brave soldiers who died in World War One - exactly 100 years to the day since our forebears first dedicated the memorial. I encourage people to attend the ceremony at Remembrance Park on the corner of Matthews Avenue and Melba Street. The war was still being fought when the memorial was dedicated, so it is one of the first World War One memorials in New Zealand to turn 100. Most similar memorials were not built until after the war was over. Riapo Puhipi (Leopold Busby) of Te Rarawa deserves our thanks for his foresight. In January 1916, he wrote to Defence Minster James Allen: "We have arranged to put a memorial stone in honour of our relatives that were at the front, dead or alive, from the county of Mangonui". The marble for the angel statue and the monumental plinth came all the way from Italy and made the journey across the world, despite the war. Another point of interest is that text on the memorial is in Maori as well as English. This is fitting, given that Te Rarawa played a major role in it being built. Many young men from Muriwhenua iwi and hapu volunteered to fight for their country and the loss of many in battles such as Gallipoli came as a huge shock. Originally, the memorial was on land donated by Colonel Allen Bell, a local farmer and newspaper publisher who became an MP. It has since been moved twice and lost an arm during the move to its current site in Remembrance Park. The memorial might have remained in its incomplete state if it had not been for the initiative of Raymond Beatson, a Vietnam War veteran who formed a war memorial restoration group with fellow Vietnam veterans Richard Taaffe, David Russell and Arthur Simeon. This group, which also includes Far North Regional Museum Trust Chairperson Phil Cross and local master carver Paul Marshall, spent nearly four years raising funds and planning the restoration of the memorial. The community and families of those who died in World War One owe a huge debt of gratitude to the group for taking on and successfully completing this project which represents thousands of hours of unpaid work. I particularly want to acknowledge Raymond Beatson's leadership and the extraordinary skill and artistry of Paul Marshall who carved and installed a replacement arm for the angel from a block of marble from Carrara in Italy. Paul also designed the restored memorial plinth which features stylised fern leaves and a field of poppies. I also want to acknowledge other organisations that contributed to the restoration project and the upgrade of Remembrance Park. These groups include the Far North (Kaitaia) RSA, The Far North Regional Museum Trust, Te Hiku Community Board and the Far North District Council. Their collective efforts have given our fallen soldiers a fitting memorial and place of remembrance that will last another 100 years. The 10-year plan the Far North District Council adopted last year set a bold and visionary direction for the Council. We had discovered critical gaps in our infrastructure and proposed an extensive works programme to address these. We also recognised the District would achieve more if everyone worked towards a shared vision, so we facilitated a community-led, visioning exercise. The road to recovery is not short and designing the future isn't a quick or simple exercise. However, our progress during 2015/16 shows we are on track to achieving these and other outcomes in our Long Term Plan. We are delivering more infrastructure projects than ever, while also rebuilding our organisational capacity and maintaining service levels. We completed emergency repairs to roads damaged by storms in 2014 ahead of schedule and we expect to complete the Twin Coast Cycle Trail - Pou Herenga Tai before July. We are also close to buying land for a new Kerikeri sewerage plant. This is a big step forward for this town where some businesses in the Central Business District still rely on septic tanks. We have also obtained a subsidy to upgrade Omanaia's water supply. This is progress for Omanaia where residents have been asking for a treated water supply for years. We are also more strategic. We are committed to supporting a new District vision which the community developed last year and Northland councils are working together to improve local government services in the region. We plan to continue this direction in the new financial year and adopted a Consultation Document for our Proposed Annual Plan 2016/17 last week. We remain committed to investing in infrastructure. However, this has to be affordable so we will be asking the communities of Te Kao and Opononi-Omapere how they wish to proceed, given that we were unsuccessful in getting Ministry of Health subsidies to upgrade their water supplies. The document also outlines a number of changes to the Long Term Plan, which we have concluded are not significant in terms of our Significance and Engagement Policy. These include an innovative proposal to strengthen unsealed roads and at the same time reduce the dust nuisance caused by forestry traffic. We are also proposing to contribute funds to a Northland LiDAR survey that will provide an evidence base for decision-making about infrastructure and resource management. We have flagged delays to the development of sports grounds in Kaitaia and Kerikeri, but still expect to complete these within forecast timeframes. We also retain our commitment to a Hundertwasser Visitor Centre for Kawakawa and plan to become an anchor tenant in the centre if it goes ahead. Please read our consultation document for a fuller picture of what we are planning and tell us what you think when we invite feedback from the community next Tuesday. Every week day in the Far North, thousands of children and young people make their way to and from school. Some walk, some cycle, some are driven by their parents and some travel by school bus. The Ministry of Transport says the proportion of primary-aged children driven by car to and from school each day has nearly doubled to 55 per cent since 1996. The Sunday Star Times recently launched a campaign called Foot It! The newspaper is encouraging parents and caregivers to choose one day a week when they walk, scoot or cycle to and from school with their children. The paper is also encouraging schools to organise 'walking buses' which allow groups of children to walk to school escorted by a parent or adult volunteer. I think these are great ideas. One of the values the Council adopted last year after facilitating a community-led visioning exercise for the District was 'Whanaungatanga' meaning family, community, connecting and caring. Those who took part in the exercise also envisaged a Far North where people were happy, healthy, safe and purposeful and families flourished. Walking our children to and from school and talking to them about the day ahead, or the day they've just had, are ways of achieving these things. The Sunday Star Times is also encouraging councils to create and enforce lower speed zones outside every school in the District. The Far North District Council has put up advisory signs near 39 schools across the District urging drivers to slow down. However, signs themselves do not create safety. Motorists reducing speed and taking extra care around schools during school hours are what make these areas safer for children. This means recognising that children are not always aware of risks, nor do they always react to situations rationally. Running on to a road to retrieve a ball may seem perfectly logical for a six-year-old who is not able to consider the consequences of their actions the way an adult does. It is up to all of us to do our bit to keep our children safe, happy and healthy. I can understand that when some people hear that the Far North District Plan is being reviewed they roll their eyes and wonder why we bother. A District Plan is something ethereal and high-level, isn't it? Many think it's something that doesn't affect the ordinary person in the street. Well, actually, it does. The District Plan affects all of us. It sets rules and provides guidance on how we can use land and other resources and how we protect our environment. Along with the Resource Management Act and plans produced by Northland Regional Council relating to biodiversity, discharges to air, water and land, it lays out rules for development and creates direction for the future. A good plan is like the frame of a house. It is mostly unseen, performing a job that few of us spend much time thinking about. But when the frame fails we quickly find out. Most of us would prefer our frame to stay in the background, because if it is it's doing its job. The Far North District Plan is your plan. The Council may draft it, put it out for consultation, run meetings and workshops, and collate submissions before making final decisions. But councillors and council officers don't know it all. They need your input to get it right and ensure the Far North is headed in the right direction. The current Far North District Plan is a good plan that came into force in 2009. But it represents thinking that was dominant a decade or more ago. The challenges we face have changed since that plan was put together. Tourism and hospitality are becoming increasingly important. And with the rise of technology more companies, including retailers, are choosing to do their business online. The onset of global warming is one of many environmental challenges we face. The District Plan review is a chance to bring the document up-to-date and ensure it represents our vision and values. Last year you showed through the Our Voices, Our Vision vision creating exercise that you are passionate about what you want your district to look like in 2050. With the District Plan review we can put together the toolkit we need, so that we can get to where you want us to go. The Council has set up a website Let's plan together to explain what the review is about and to encourage community involvement. It also includes a link to a submission form and lists dates at which Council's District Plan staff will be in your community to answer your questions. Whether you're building a house, a shop, a garage, a deck, or planning to plant trees, the District Plan is a document you'll probably become familiar with. It's in all of our interests to make sure it is workable and leads to logical and common-sense decisions. The Far North has great potential. Working together to create a new Far North District Plan will ensure we all move in the right direction. It's easy to be blasé about the growing number of days and weeks that highlight a seemingly endless list of worthy causes. But one annual awareness-raising event New Zealanders should take notice of is Seaweek. This weeklong programme of events, which starts on Saturday, encourages Kiwis to renew their connections with the sea. It's easy to forget how the sea has shaped New Zealand's history. Most of us have ancestors who were carried to these far-flung islands on the waves and some of the most tumultuous moments in our history have been on the ocean. Winning the America's Cup and sending a flotilla of yachts (which I was part of) to French Polynesia to protest against nuclear testing are just two. The sea is also a big part of our economy. Our marine fisheries waters are the fourth largest Exclusive Economic Zone in the world, while our coastline is the world's ninth longest. It is not surprising then that seafood ranks as New Zealand's fourth to fifth largest export earner. I shouldn't need to explain the recreational and cultural importance of the sea in our lives. We go there to fish, swim, surf, boat, dive, gather food or just to escape the pressure of our daily lives and reflect. Many of us would permanently live at the beach if we could. I therefore commend the New Zealand Association for Environmental Education for organising Seaweek which is now in its 24th year and has a 'Healthy Seas, Healthy People' theme this year. I encourage you to go to the Seaweek website to find out about some of the educational and worthwhile activities planned for the Far North. These include whale rescue training at Mangonui, a beach clean-up day at Taipa, guided snorkelling and kayaking at Tapeka Point near Russell, a public talk at Paihia about New Zealand's deep sea wildlife and pre-school fun times at Kaitaia Library. I would also like to take this opportunity to publicly thank those people who help to keep our coastal areas tidy. A number of people at Waipapakauri Ramp, where I live, regularly remove rubbish from the foreshore. On the east coast, a group of caring Bay of Islands residents, who operate under the name Bay Beach Clean, have been removing rubbish from the Paihia foreshore every second Sunday since 2013. These amazing Kiwis have picked up tonnes of rubbish over the years and recycled about half of this. Without their efforts, our coastal areas would be less beautiful places to live in and visit and more hazardous places for marine mammals and birds. Also deserving of praise is Kaikohe church group Helping Hands who cleared rubbish from many of the district's most popular beaches last year and are currently tidying up Monument Hill in Kaikohe. Please help these groups by taking your rubbish home or disposing of it in litter bins when you visit our beaches and remember that healthy seas equal healthy people. We all produce rubbish so the rules that determine how we deal with it are relevant to all of us. The Far North District Council currently has two bylaws that deal with waste, but are more than five years old. The Council proposes to combine these into one Solid Waste Bylaw that takes into account changes to legislation and waste minimisation practices and better supports our goal of reducing the waste we send to landfills. Education, targeted engagement and voluntary accords have a well-established role in many areas of waste management and waste minimisation. The Council proposes to continue using these to influence the behaviour of some sections of the community, including boaties, tourists, schools, sports clubs and marae. It will also encourage commercial businesses to put in place systems to reduce waste. However, education and voluntary measures need to be underpinned by regulation, so they are taken seriously by the public. The Solid Waste Bylaw proposes a number of new rules designed to better manage and reduce waste. Owners and managers of hotels, motels and apartment buildings will need to manage and reduce waste on-site, while people planning public events will need to develop and get Council approval of waste management and minimisation plans. The proposed bylaw also requires households to ensure that not more than 10 percent of the rubbish they send to landfill for disposal is recyclable. In other words, at least 90 percent of the waste in the rubbish bag you leave at the kerbside for collection or take to a refuse station needs to be waste that can't be recycled (e.g. polystyrene and non-recyclable plastic). There is a high chance that refuse contractors won't accept your rubbish bag if it is full of recyclable waste, such as glass bottles, newspapers and tin cans. These items should be placed in the approved kerbside recycling container or taken to one of the 24 recycling centres across the District. This is a significant shift in our approach to waste minimisation, so we need to know how households and businesses feel about this proposal. I would like to think that we are ready for this change. Recycling is now a well-established routine in our daily lives. Most people also accept that we cannot just keep burying waste in the ground. We just need to encourage more people to adopt the recycling habit which can actually save them money. We sought the views of waste industry operators and looked at how other territorial authorities have addressed these issues before developing this bylaw. We have also based the proposed bylaw on the recently adopted Auckland Council Solid Waste Bylaw which was subjected to extensive public scrutiny and legal review. We are now looking to the Far North community to tell us if we have got it right. I encourage you to find out about the bylaw and the associated controls and to have your say before the public submission period closes next Wednesday (24 February) at 4:30pm. One of the most important projects I have been involved with since becoming the Mayor is the development of an economic action plan for Northland. Last Thursday, I had the pleasure of attending the launch of Tai Tokerau Northland Economic Action Plan which identifies 58 projects that will help to grow Northland's economy and create jobs. We all know that Northland's transport and digital infrastructure lags behind the rest of New Zealand. I am proud to have played an advisory role in developing a plan that is a game-changer in terms of creating the conditions necessary for business growth. The proposal to create a four-lane highway between Whangarei and Auckland will slash the journey time between New Zealand's largest market and the Far North and make our district more accessible for people wanting to visit or do business here. Upgrading and maintaining Mangakahia Road as a state highway will also improve our connectedness to the south. Similarly, prioritising investment in digital infrastructure so that broadband and mobile phone services are available across the region will make it easier for people to do business or access training opportunities. We also know that Northland has one of the highest youth unemployment rates in New Zealand. This plan includes initiatives designed to connect young people to jobs in growth industries and sets an ambitious goal of reducing youth unemployment from more than 20% to 12 percent over the next four years. Some of these jobs may be in the farming, forestry and wood processing sectors. A new proposal to trial high-performing cultivars of Manuka could help to put unproductive land into economic use if it is successful. Similarly, a wood processing facility could be developed at Ngawha if a study currently in progress finds this to be viable. Tourism is also a focus area in the plan. The $4 million boost for the Hundertwasser Arts Centre in Whangarei is also a boost for the Far North, because the centre will help to draw even more tourists to the world-famous Hundertwasser Toilets in Kawakawa. Plans to complete the Twin Coast Cycle Trail, revitalise the Twin Coast Discovery Highway and step up marketing and promotion of Northland as a tourist destination should also result in visitor growth. It is often said that there is no silver bullet when it comes to creating economic prosperity. This plan proves that by bringing into focus a wide range of current and new projects designed to lift our wellbeing as region. I would like to commend and thank the businesses, government agencies, local authorities and Iwi leaders who put their ideas, vision and passion into Tai Tokerau Northland Economic Action Plan. We will only solve Northland's problems and address opportunities by working together. This plan is a testimony to that. January is a good time to take stock when you're a Mayor. Another calendar year is just behind you and a new year lies ahead. You're also halfway through the local government fiscal year, so are keen to review progress on some of the main capital projects in your Council's Long Term Plan. I am pleased to report that we are planning to complete or start two flagship projects, which have been years in the making or planning, in 2016. The Twin Coast Cycle Trail - Pou Herenga Tai had effectively stalled before I became the Mayor. We got this project back on track last year by securing agreements from landowners, as well as funding from the Government and Northland Inc. We aim to open all unfinished sections of the 84km trail this year. We also plan to acquire land for a new Kerikeri wastewater treatment plant after consulting the community about this project last year. Staff are investigating a rural site that offers the best long-term benefits in terms of providing increased treatment capacity, while having the least negative impact on the community. Meanwhile, our commercial company Far North Holdings aims to complete a $13 million, 173-berth extension to the 250-berth Bay of Islands Marina at Opua and begin a major redevelopment of the passenger terminal at Bay of Islands Airport. Renewing core infrastructure will remain a priority for the Council in 2016. We are developing a business case to support a request for Government funds to strengthen unsealed roads heavily used by logging trucks. We also plan to continue talks with the Te Kao community about affordable options for improving the quality of drinking water a private company supplies to homes. The Ministry of Health declined our application for a subsidy to upgrade the scheme, saying it was unaffordable, so we need to find out how much Te Kao residents are prepared to pay for improvements. Similarly, we plan to ask households connected to our Omanaia and Rawene water supply if they are happy for us to go ahead with improvements that qualify for a Ministry of Health subsidy, but would still mean higher water rates. We also plan to continue investigating ways of making our water supply at Opononi-Omapere more drought-resilient. The Ministry of Health declined our subsidy application, because there was community opposition to us taking water from Waimamaku River so we need to explore options the community supports. Improving community facilities also remains a priority for Council. We are installing a new playground at Jaycee Park in Kaitaia this week and aim to complete an upgrade of Remembrance Park in time for the war memorial centenary commemorations in March. We are also close to completing a long overdue upgrade of the rugby grandstand at Lindvart Park in Kaikohe and plan to begin developing sports fields at Moerua Park, Kaitaia, in line with a plan to develop a Te Hiku Sports Hub at the park. This is not an exhaustive list of our capital projects in 2016. We will report on progress with other projects and outline new projects when we consult the community for our Annual Plan 2016/17.